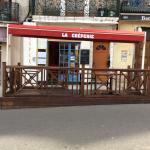 We had a lovely dinner for 5 sat outside this wonderful creperie. 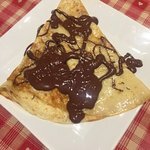 The galettes were delicious and the sweet crepes just the best we have ever tasted - the chocolate one was just divine. A great husband and wife team run it - highly recommend if you are in the region. 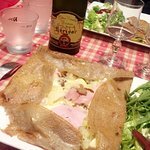 A trip to the creperie was a highlight of family holidays from my childhood, so was looking forward to trying again, this time with my wife & daughter. 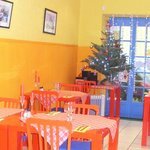 We were not disappointed and this is an excellent, authentic restaurant with very reasonable prices including a good choice of regional beers, ciders and local wine. 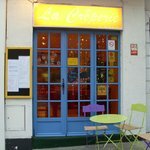 The owners were very friendly and we really enjoyed our evening. Note that on our visit on a Sunday evening they did not open until 7pm so opening times shown here (through Sunday afternoon) may not be quite right (in our experience). I arrived after a four hour bike tour over private roads and beautiful sceneries when i decided to stop and enjoy the day lunch at this place eventhough nobody was sitting on the terrace. I was served immediately by a friendly waiter and I choose for the day lunch as it was to hot for me for having pancakes. The starter was a could melon soup which was delicious and unexpected. Main course was stew of rabbit and for an additional 2 euro I received a nice cup of fresh fruit. They also serve excellent beers from Normandy. The waiter asked me after the starter if he could serve the main course but I deserved a decent break, so postponing it was no problem at all. Same occurred for the dessert. I have to say : a nice place to stay with a local pub next to it so you learn something from the habits of them. Well not really but we tried them in Normandy and in Paris. This place beats them hands down. Fresh ingredients - a bit of crisp on the edges - not too oily. 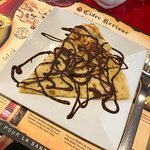 Ohh and the sweet crepes are incredible also. A highly recommend for this little find. A small restaurant based right In the village main square. 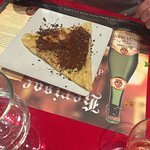 It was a Sunday night so there was not much open, until we stumbled across La Creperie. A small cafe style place with limited seating outside. The proprietor and his wife were very welcoming. 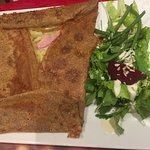 Menu was simple but good, plenty of savoury crepes and salads. Not too expensive. 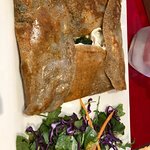 Been to La Creperie? Share your experiences!